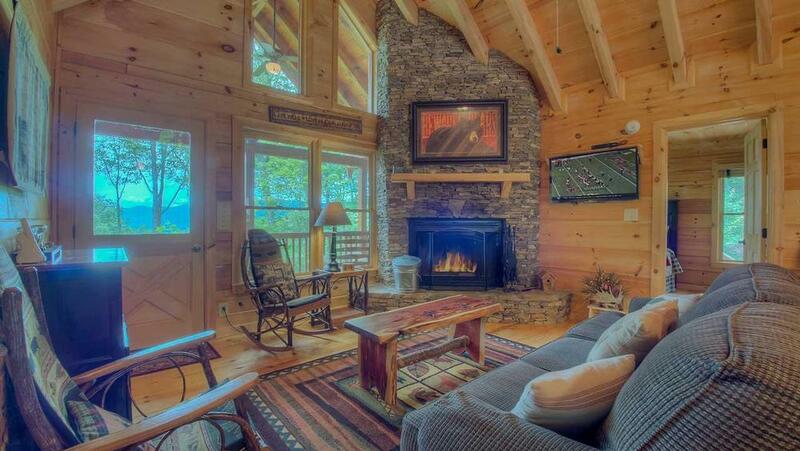 This enchanting Georgia mountain cabin rental is indeed a Lil' Slice of Heaven. 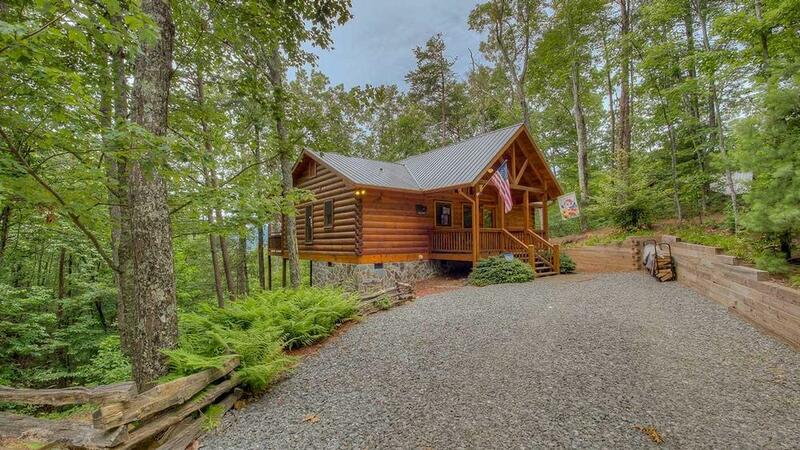 Perfect for a romantic getaway or a few couples, this two bedroom cabin has plenty of room but is small enough to feel warm and cozy. It's a place so relaxed and comfortable; you'll feel like you're walking on clouds. Natural finish tongue and groove walls, as well as Amish and mountain log furniture, give this tastefully decorated all-wood cabin its authentic alpine feel. Your eyes will be drawn to its great mountain-themed artwork and the many touches of love put into its décor. Relax on the sofa or two rockers with a good book in front of the wood-burning stone fireplace — even on the chilliest winter night, you'll feel warm and cozy inside. Naturally, you'll also want to make the most of being in the great outdoors. 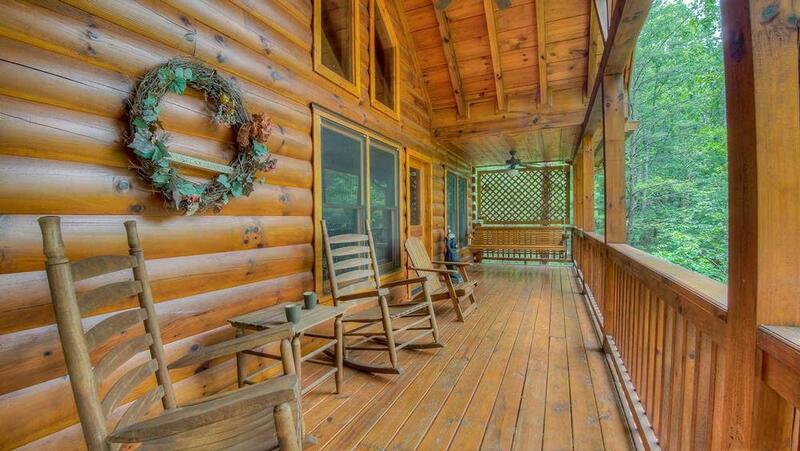 Whether you prefer sun or shade, there are plenty of both to be had on the deck or covered porch. Sip refreshing lemonade while lounging on the porch swing or one of the rockers. Looking through the canopied trees towards the mountaintops, you'll feel so at peace here in your quaint little haven. Lil' by lil', the sky will change a spectacular array of colors before you as the sun goes down. Enjoy romantic evenings under the stars as you share a champagne toast by the light of the gas fire stand, or while immersed in the soothing bubbles of the hot tub. Both charming bedrooms, found on the main level, offer heavenly mountain views and adorable, nature-themed quilts draped over queen beds. Snuggle under the covers with the one you love and enjoy a divine night's sleep. In the morning, you can step out to the deck if you'd like to take in a truly glorious sunrise. 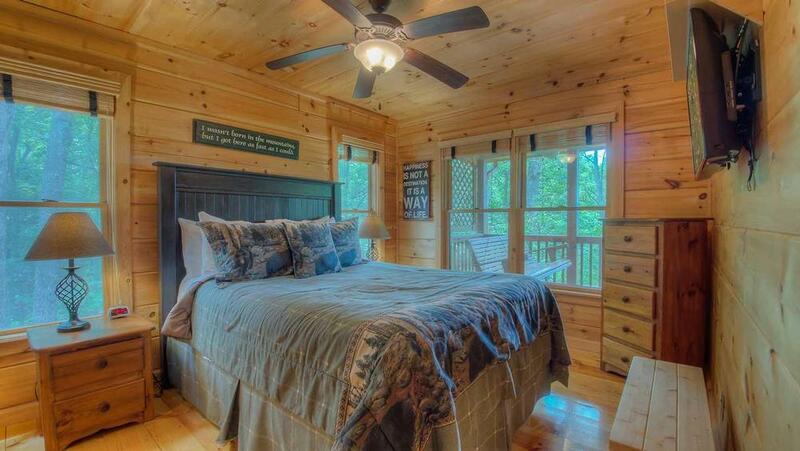 Spend some time on cloud nine with your special someone, and enjoy your own Lil' Slice of Heaven in the North Georgia Mountains. 02/19 - We loved the warm homey feeling of the cabin and very much enjoyed the hot tub and being able to sit by the gas fire pit when you stepped out of the tub. We are repeat guests and love the people and customer care they give. We will continue to come back for our little escapes to the mountains. 01/19 - This was the most enjoyable vacation we have had with our children. They want to come back again for a week next year, we thoroughly enjoyed every moment. The cabin was absolutely perfect!!!! You all did a wonderful job and were so incredible to work with!!! 01/19 - Liked everything about the cabin. Staff were helpful. 12/18 - Peaceful and comfortable. Amazing. 11/18 - Loved the viewssssssss!!!!! The amenities also were fabulous (i.e. hot tub, fire pit, swing, fireplace). This is a great company. I loved the customer service! I called with an issue and the lady even called me back to see if what we discussed was rectified. Wow! That was over and above. Will be using you all again. 10/18 - The directions to the cabin were simple and everything was well marked and accessible. Very personable and professional staff - warm/welcoming. 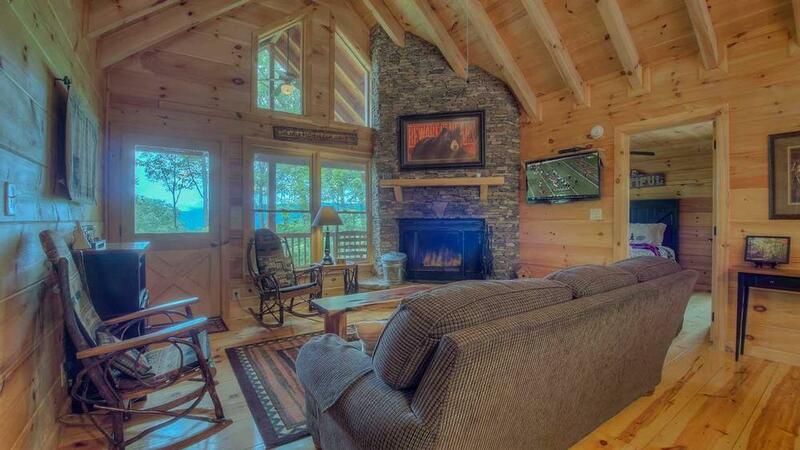 11/18 - Beautiful wood interior, fireplace inside and a hot tub and gas fire pit outside. The note, lights turned on, tv on and feel when we first arrived made us feel right at home. 10/18 - We enjoyed the hot tub & the back deck of the cabin. All the appliances were great & very useful especially the washer & dryer. The entire cabin furnishings were great. We were greatly impressed by your company & your professionalism. We look forward to staying at this cabin again next year. 09/18 - Enjoyed the fire pit, hot tub, rockers, swing. Very helpful and professional staff. Made renting easy. Went to Toccoa River restaurant at staff recommendation and was very pleased- have used you all in the past- have always had a good experience. 08/18 - We enjoyed the view and the quiet and the fact that the cabin wasn't way up high.The staff were very friendly and helpful with letting us know activities close to the cabin. Also the directions were excellent. 06/18 - Very clean, everything we needed was provided. Cozy, snuggled in the mountains, great view. Loved the homey decorations. Didn't have many interactions with the staff but when I requested a quote, was called back right away, she was very friendly. Loved the gift bag in the cabin, very thoughtful. 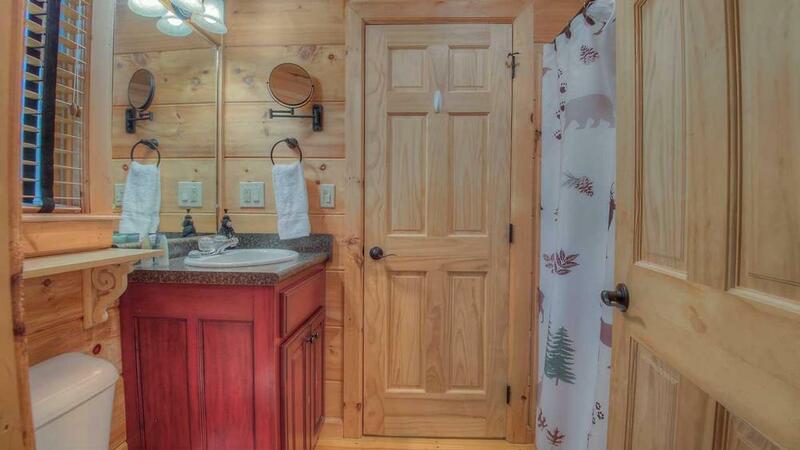 06/18 - Clean, quiet, private, cabin with all the amenities available. Great company. Friendly and helpful staff. Fantastic cleaning staff. 06/18 - The comfort, peace, cleanliness, the bathrooms in each room & the "CONVENIENCE OF ANY & EVERYTHING! IF I COULD RATE OUR EXPERIENCE A 20, I WOULD GIVE IT A 25!! VERY FRIENDLY PROFESSIONAL & CARING!! 05/18 - Beautiful place for a relaxing get-away. Just what we were looking for. Escape to Blue Ridge is first-class. 4/18 - We thoroughly enjoyed the privacy aspect of the cabin. The outside deck and views were spectacular. 3/18 - What a great time we had. We had our privacy, and a great house to be together. You do a great job. 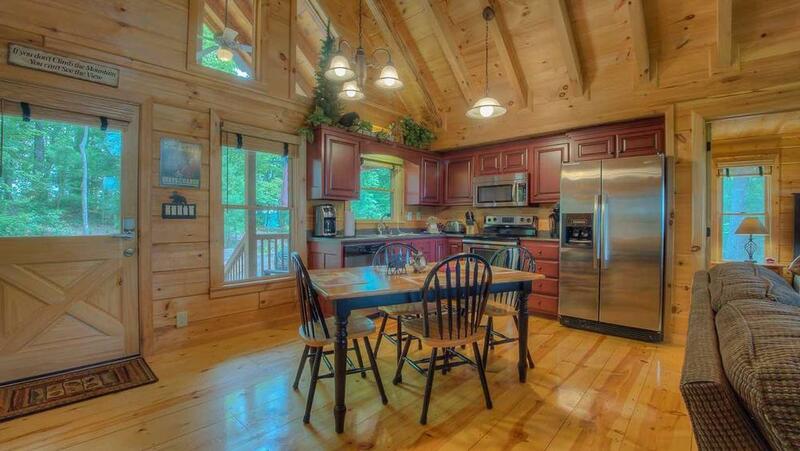 1/18 - Beautifully appointed cabin that lends to a relaxing time! This is our fourth year staying here, and we love it! Escape to Blue Ridge is very easy to work with! 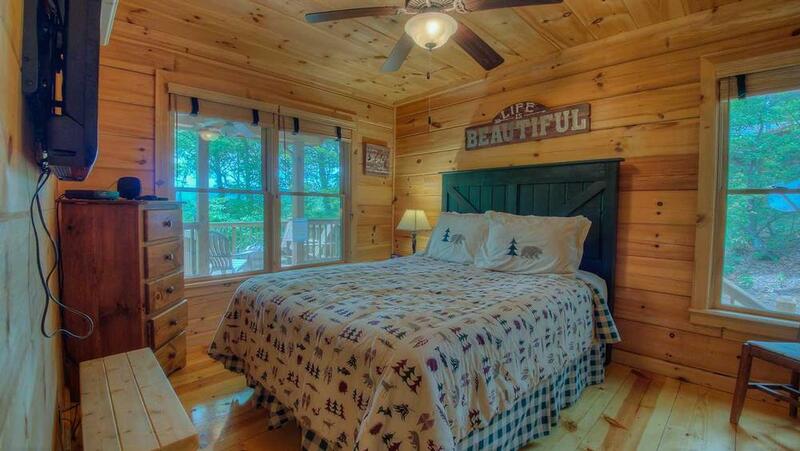 1/18 - This cabin is exactly what it says it is : a little slice of heaven. It was warm, cozy, inviting, clean, peaceful, and had all the amenities we needed to enjoy the New Year away from the hustle and bustle of the city. The scenery was breathtaking, and it was the perfect place to be, whilst my family was visiting from Scotland. The staff are knowledgeable about the properties and made a good recommendation with regards to our price range and sleeping arrangements. They were professional at all times, and answered all my questions in a timely manner. They followed up telephone conversations via email and there was no confusion regarding driving directions. 10/17- The coziness and quietness of this cabin was so wonderful. We hated to have to leave. It was perfect for what we wanted and expected. The staff were very helpful and informative of the area and things to do and places to eat. We loved the small town of Blue Ridge. We hope to go again one day. 09/17- View, comfort, isolation, amenities. Very satisfactory. 08/17- From the moment we opened the front door when we arrived, we fell in love with this cabin. It was perfect for us. Extremely clean and so cute and cozy. 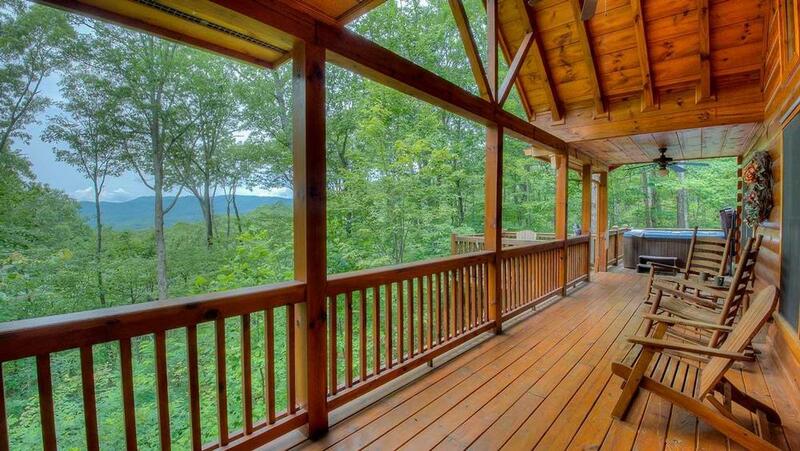 The back deck was amazing with beautiful mountain views. So quiet and peaceful and relaxing. This is the third time I have used your company for mountain cabin reservations and I will again. Everything was handled professionally and on time, exactly as promised. 08/17- We go to St. Simons Island usually once a month for a week. For her birthday, my wife wanted leaves rather than sand. She wanted a "view" which led to our decision regarding Lil' Slice of Heaven. We were NOT disappointed. Absolutely breathtaking. Everyone I spoke with (I don't do on-line booking unless my 10 year old grandson is around) was more than cordial. I felt like I was the only client you had. I would not think of booking a rental in Blue Ridge without checking with you guys. 04/17- The cabin was immaculate and very cozy. The outdoor fire pit overlooking the mountains was a hit. Very friendly staff, quick response time, very thorough instructions for getting to the cabin and how to use the amenities. 03/17- Li'l Slice of Heaven truly lived up to it's name. There is not 1 single thing we would have changed. It was the perfect size. Beautifully decorated. Amazing view from the deck to watch the sunset. We can't wait to go back. Escape to Blue Ridge was nothing but professional from the very first email and call. Friendly and professional. Top notch group of people. 01/17- Everything was super nice. The mountain views were fantastic. The amenities were perfect. The cabin was very clean and we loved the music playing when we arrived. Your company is well organized. Everything on the website was spot on. 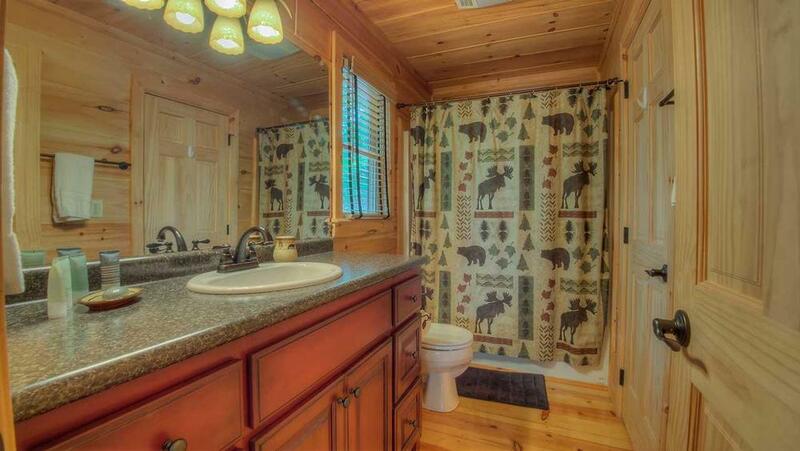 I was very impressed by the cleanliness of the cabin along with the location. The pictures don't do it justice. 01/17- The cabin is very clean and comfortable. 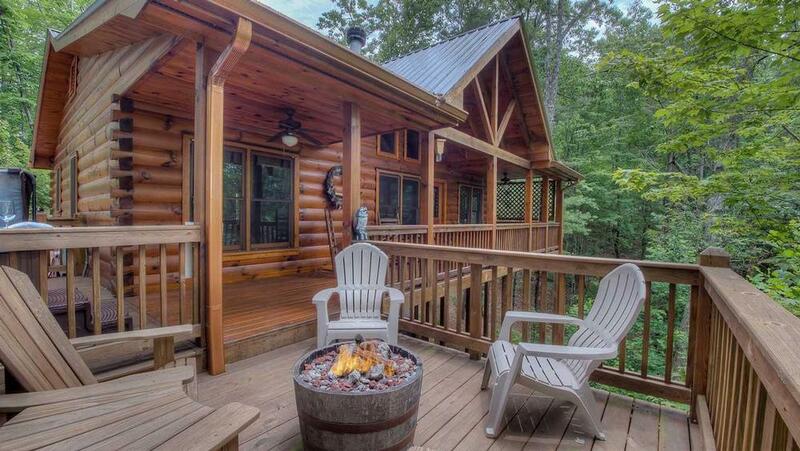 The furnishings are nice, and the amenities such as the fire pit and hot tub are excellent! Very easy company to deal with, prompt responses to any questions we have had in the past. 11/16- The cabin was in a great location. It was clean and had all the amenities we needed. I have been dealing with your company for 4 years and the staff are always professional, helpful and friendly. 10/16- New with modern appliances, dishes and cookware and grill. Had dinners watching sunset after busy days of hiking and exploring the towns. The company is very organized. 09/16- The cabin is very warm and welcoming, everything was well thought out. We loved that everything was available to us, pots, pans, Keurig, and all the other things we use at home on a daily basis. The towels and bed linens are of premium quality and that level of detail means so much! 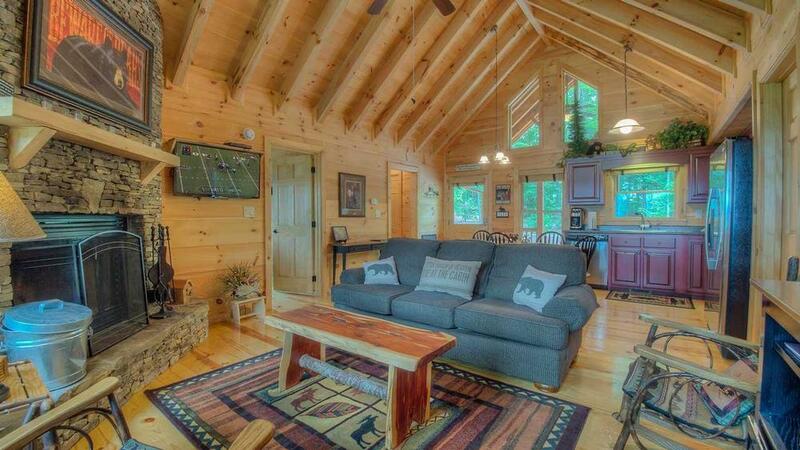 We also loved the size of the cabin and the open floor plan! The Escape to Blue Ridge staff are very professional, attentive, helpful and knowledgeable. 09/16- The views, location and design were our favorite features of the home. The staff were very competent, professional and friendly. 07/16- The atmosphere was great. 07/16- Loved the layout, very well appointed w/everything we needed ... Gorgeous view - incredibly clean. Great experience. We have rented w/ several companies and VRBO with not much luck. 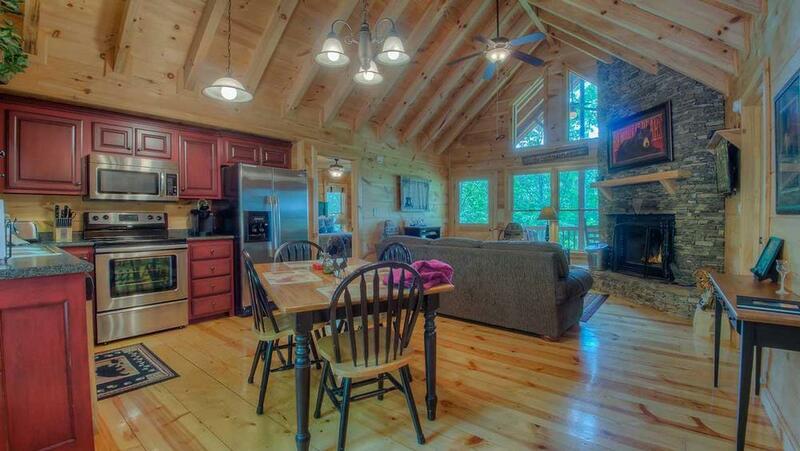 This was one of the nicest cabins we have stayed in. 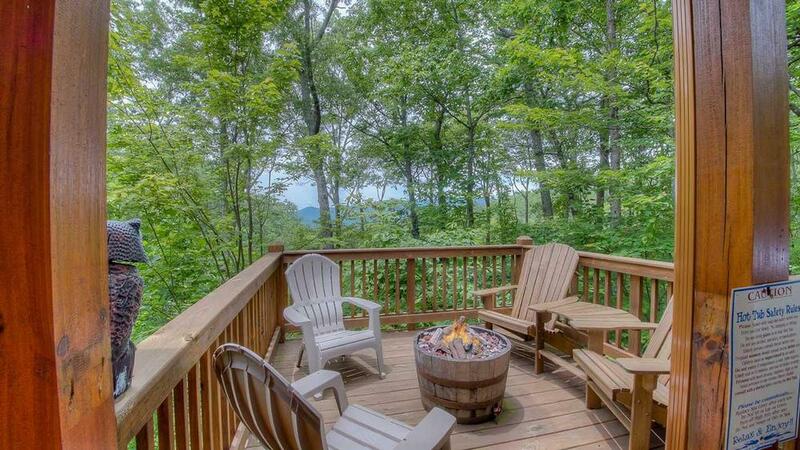 05/16- The view, the back porch, hot tub, fire pit. 05/16- We enjoyed the back deck the most, the hot tub, fire pit, the rockers & swing, and thr grill. It was nice having all the kitchen supplies to make meals. We loved the fireplace as well. 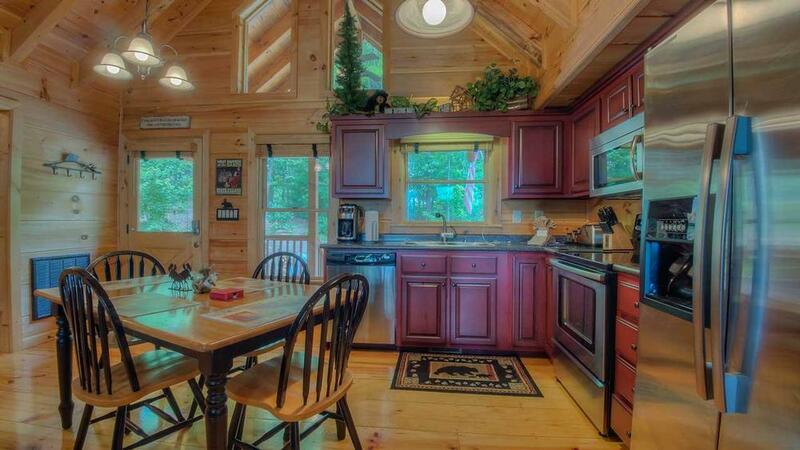 The decor suited the cabin perfectly and made it feel cozy. 04/16- The home was well appointed and clean and had everything you could possibly need. 03/16- Very cleans, nicely decorated, well furnished, modern up to date appliances. 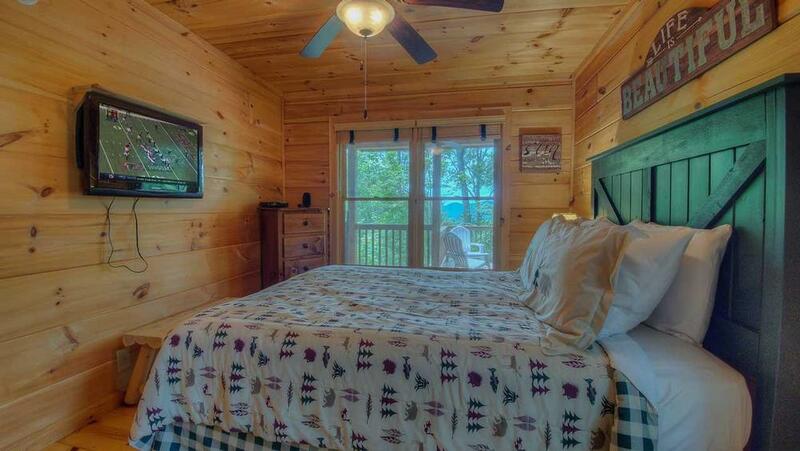 Comfortable beddings, great view, love the hot tub and back deck area. 01/16- Layout, hot tub, fire pit area are all great! 12/15- The home was so nice and had a cozy feel about it. My husband and I really felt comfortable here. Booking this trip was very easy, I was able to find what I wanted online and then the representative I spoke with on the phone was extremely friendly and helpful. The directions to the cabin were very easy to understand and all of the information we needed about our stay and about the area was easy to find in the cabin. I am looking forward to our next visit. 12/15- This home was smaller than the previous homes we have stayed in but it was so cozy. I loved the modern appliances! The washer and dryer were great. I have been vacationing with your company for last 7 years, sometimes twice a year. I really like the communication. 11/15- The cleanliness was the most important. 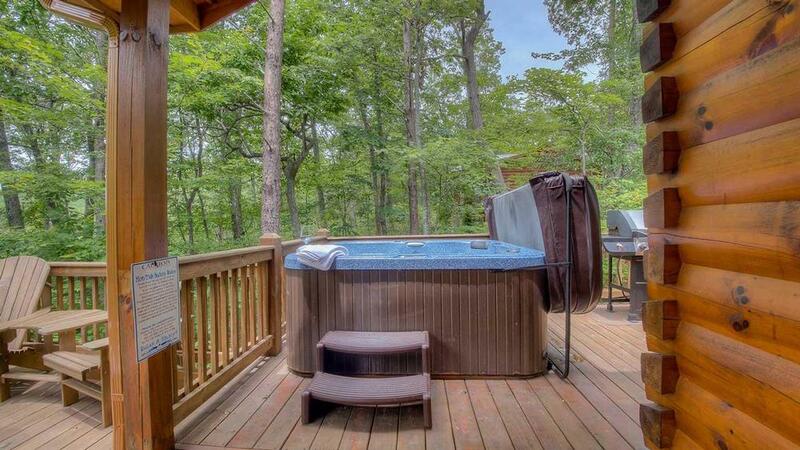 The cable TV , hot tub, fully equipped kitchen and bathroom. Plus the indoor and outdoor fireplace was perfect due to the weather. Everything was great from the beginning of making our reservations. We're very impressed. 11/15- Loved the comfy beds and the fact that there are 3 flatscreen tvs. 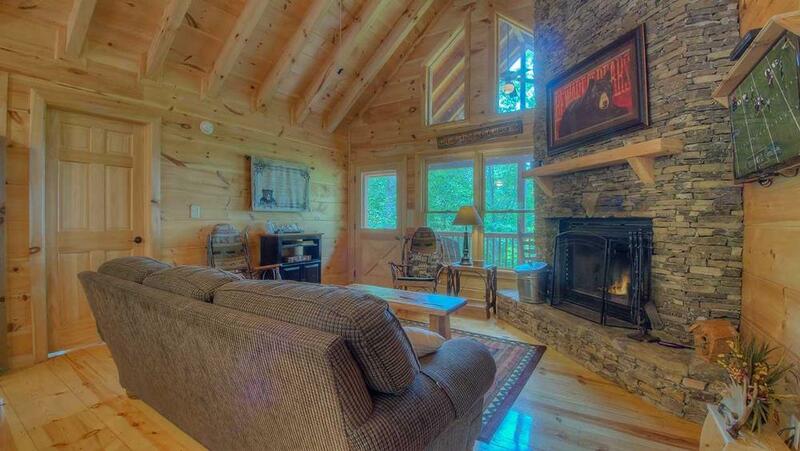 Love the view, the inside fireplace and the Kureig coffee maker! The roads leading up, and I mean, up to the cabin are a so nice--mostly paved and the gravel road feels smooth. The staff was friendly and helpful. I spoke with Karen and she was always pleasant and helpful. 11/15- The cleanliness and all of the extras the homeowner added made it feel like home. Even the barbecue grill was clean. That is often not the case. Also, the homeowners provided the chemical caplets for the hot tub after each use. This made us feel like it was sanitary and well maintained. Excellent customer service. We didn't realize the fireplace was wood burning so we were prepared. The person on call with your company brought us some kindling to help us get a fire started. We were thoroughly impressed and because of her, we would definitely rent again and recommend you to other people. 10/15- Clean and perfect little cabin. Amazing view. Very helpful when we were lost and couldn't find the cabin. All around amazing experience. 09/15- The home was charming and welcoming. I couldn't have asked for anything better. Just wish I had more time to spend there. Everything was handled extremely well. The directions were spot on and everything we needed for our time there was accounted for. 09/15- Lil' Slice of Heaven was a beautiful cabin with a most tranquil view overlooking the mountains. The home was very homey and quiet. This is what we wanted. Just minutes away from Blue Ridge. 09/15- View, hot tub, fire pit, accomodations all were awesome! 08/15- The beautiful view of the mountains from both the living room and the porch. This home had every amenity I can possibly imagine! We loved every minute of our stay. Excellent, professional service. Will be using you again! 08/15- Clean, quaint, nestled. Convenient to downtown Blue Ridge. We appreciated the well written instructions for the door lock, TV's, Wifi. All of the light and fan switches were labeled which made it easy. Nice welcome basket. Impressed. Everything has been a pleasure. The website is good, I was able to get in touch with people who were all extremely knowledgeable, professional, and friendly. The emails kept me well informed and everything went smoothly. 08/15- We loved our stay at Lil Slice of Heaven. 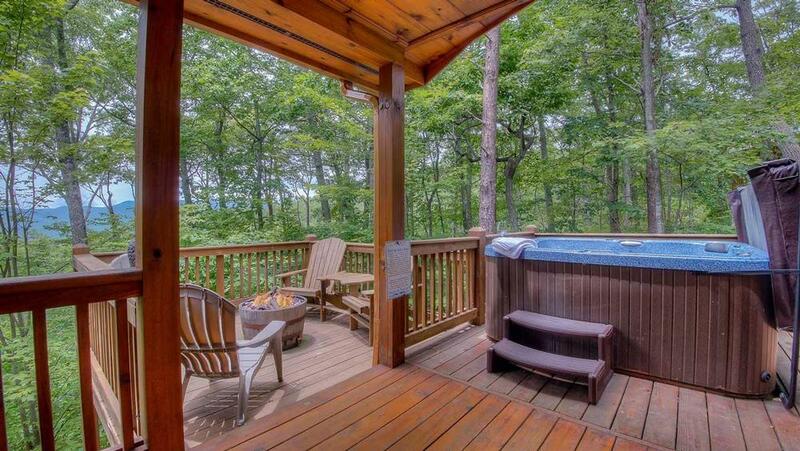 Especially hot tub, fire pit, and of course the view. We hope to visit again. Escape to Blue Ridge was a great company to work with. They really listened to what I needed. Even though it was a last minute reservation they really tried to find what I needed. Will use this company in the future. 08/15- A slice of heaven was amazing. We can't wait to return. 07/15- It is a charming cabin. Close to lots of hiking adventures. Has all the comforts of home. Great views if the mountain. Mountain bliss! Very professional and friendly. Lots of attention to detail. 07/15- The home was cute and very clean. the deck was adorable with swing, hot tub and fire pit. We enjoyed them all! The staff was great. Helped us find the right size cabin and when we wanted more information about hiking and directions the staff was a huge help they helped us get to the start of a hiking trail we were having trouble finding. They were really great. 06/15- The cabin had all the comforts of home. It was a delightful place to just relax and enjoy and is located close to shopping in Blue Ridge. 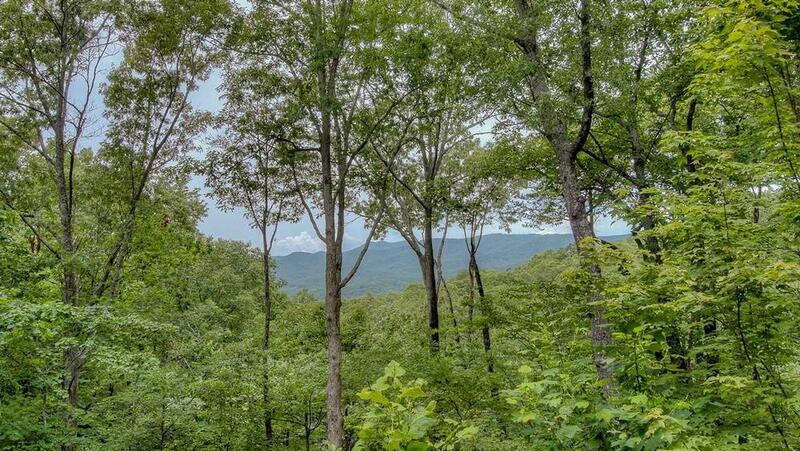 You can take short trips to Dahlonega and Blairsville, too. The lady we made the reservation with was most accommodating and helpful. You are very interested in having your guests have a delightful experience and that is really fantastic. Thank you! 03/15- Hot tub, fire pit, kitchen were amazing...the perfect getaway. 01/15- We loved spending time in the hot tub each evening. The views here are incredible! 11/14- Fireplace and fire pit. Location is great too. Staff very helpful and knowledgeable. Have used this company several times and will continue to do so. Love the large selection of homes available. 11/14- Fire stand on back porch was a favorite and a great place to stay. 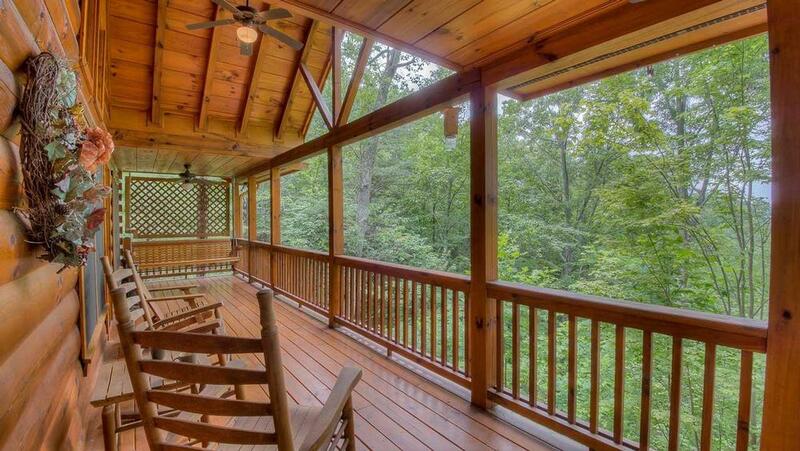 09/14- The view, the deck, the interior decor, and the location of the cabin.....in that order. Everything CLEAN and new. VERY VERY professional and communicative.